I used a Tim Holtz stencil and some distress inks (Mustard Seed and Peeled Paint) to create the background and then copic coloured the giraffe which is from Lovie Friends by Lil' inker and popped him on top. The sentiment is also from the same stamp set and has been heat embossed onto some Mocha card by Papermilldirect. The leaves were also coloured using Copics and are from MFT Build-able Bouquet. Hop on over to the blog to see what the other talented designers have come up with this week. Off to enjoy the sun in the garden now while it lasts!! A super tag Wendy, such an adorable Giraffe. Wendy, this is just adorable. I love the yellow brick wall and the sweet giraffe. Fun tag! Cute giraffe and sentiment! Thanks for joining the challenge at Tag You're It! Oh goodness, so glad you decided to stay indoors and create this darling tag! Love every bit, especially the fun sentiment!!! 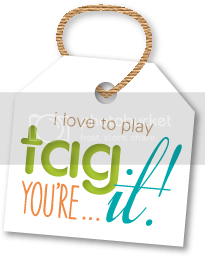 Happy to have your talent in the lineup at Tag You're It! This tag is so cute! Love it! Thanks for sharing at Tag You're It! What a fabulous background, love the giraffe! Many thanks for joining us at Tag You're It Challenge.